Okanagan Falls, located between Penticton and Oliver, holds, I think, a sweet spot for growing grapes and making wine. It has long warm days and cool nights, which allow the grapes to reach full ripeness as well as keep their acidity. The Okanagan Falls Winery Association, consisting of 14 wineries, with 32 vineyards, held a tasting recently, which I attended. In the Okanagan Falls area, you can taste quality sparkling, white, and red wines. Here are 12 wines from the tasting that I really enjoyed. I hope you will enjoy them as well. Blasted Church Vineyards Sauvignon Blanc 2017 – A ripe stone fruit nose. Medium minus body, dry with salty minerality. Tart green fruit and stone fruit flavours. Medium acidity. 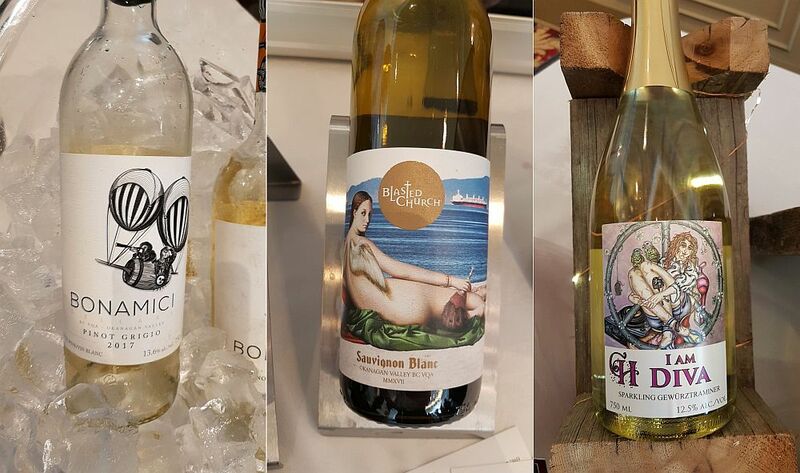 Bonamici Cellars Pinot Grigio 2017 – Fresh stone fruit nose. Juicy stone fruit and pineapple flavours along with a green edge. Dry with higher acidity. Perfume at the end. Crescent Hill Winery I am Diva Frizzante Gewurztraminer 2017 – A sparkling Gew from BC. I’m not sure I’ve seen any before; maybe one. This one has a nice lychee nose. Dry, high acidity with small, creamy bubble. Lychee and rose petal flavours. Skaha Vineyard Pinot Blanc 2018 – Fresh stone fruit nose. Full of tropical fruit flavour with lesser amounts of apple followed by green fruit, and a hint of lychee. Medium body and acidity. Pentage Winery Pinot Gris 2017 – Light stone fruit and pear aromas in the glass. Medium body with light acidity and light pear flavour. A delicate wine. Pentage Winery Roussanne/Marsanne/Viognier 2013 – Wow, an aged white wine from BC. This wine does not disappoint! It has light toast, butterscotch and tropical fruit aromas. Medium body, round with a thicker mouthfeel. Medium minus acidity. Butterscotch, toast, and roasted apple flavours, along with some pepperiness. Nice. Elegant. Pentage Winery Syrah 2014 – Meaty, red and black fruit nose. Off-dry medium body and acidity, along with some minerality. Bright cassis and black fruit flavours. Peppery too. 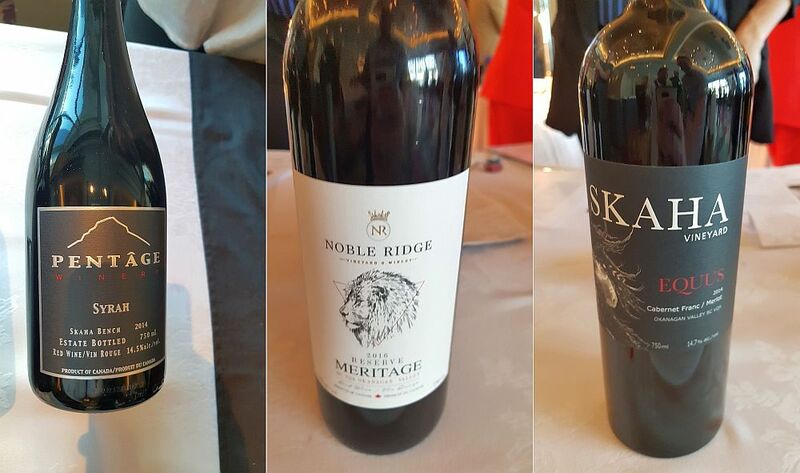 Skaha Vineyard Equus 2014 – A blend of Cabernet Franc and Merlot. This wine has a dark, ripe black cherry nose. Full body, with flavours of ripe, black cherries, candied cherries, and dark chocolate. Peppery. Medium tannins. Good structure. 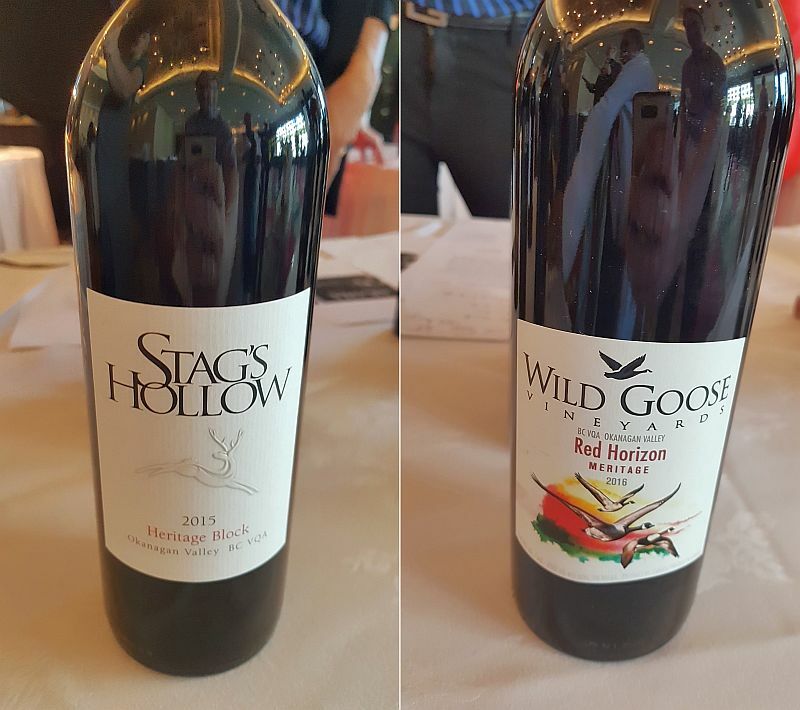 Stag’s Hollow Heritage Block 2015 – A blend of Merlot primarily and lesser amounts of Cabernet Franc, Cabernet Sauvignon, Petit Verdot and Malbec. Medium garnet colour. Cedar, vanilla and red fruit aromas. Fuller body, dry with medium plus tannins. Cedar and ripe red fruit flavours. Peppery mid to finish. Nice.